Picking outdoor furniture can be difficult. 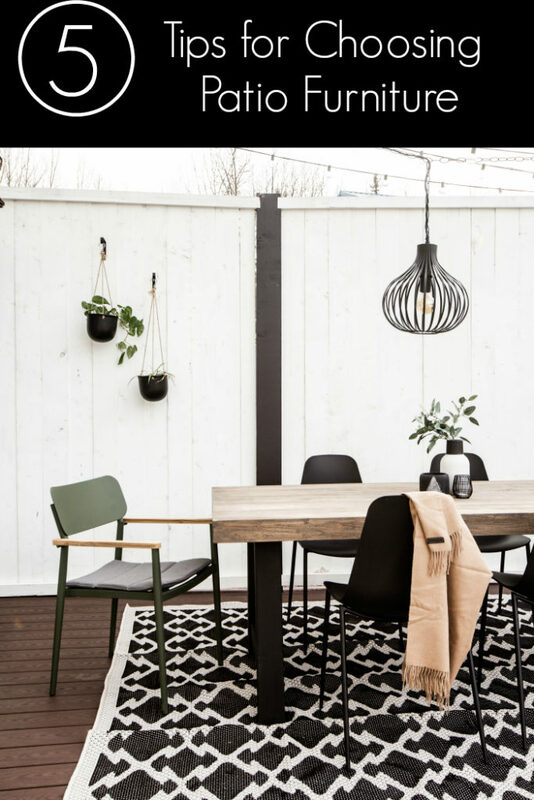 Here are five great tips to keep in mind when choosing modern patio furniture! 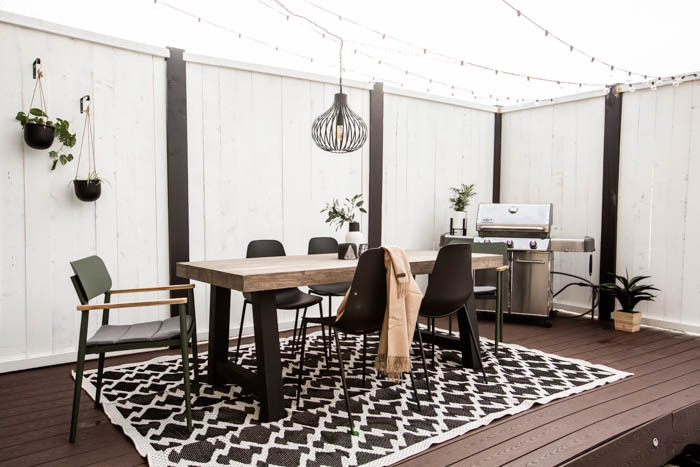 Did you see what happened when we showed off our deck last year? We didn’t have any chairs to share. We ended up dragging our kitchen chairs outside every time we wanted to eat! lol. It’s not because we didn’t waaaant patio chairs, or even that we couldn’t afford any new ones. It’s because we were stuck on which ones to get. Choosing any furniture in your home can be difficult because you want it to last a long time, be comfortable, and be worth every penny. Outdoor furniture is no different! 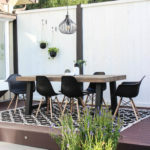 I went through some buying decisions and I’m hoping that sharing my five tips for choosing modern patio furniture will help you when making your decisions too! Last year we didn’t even have a deck. We built this space over the course of a week or so. 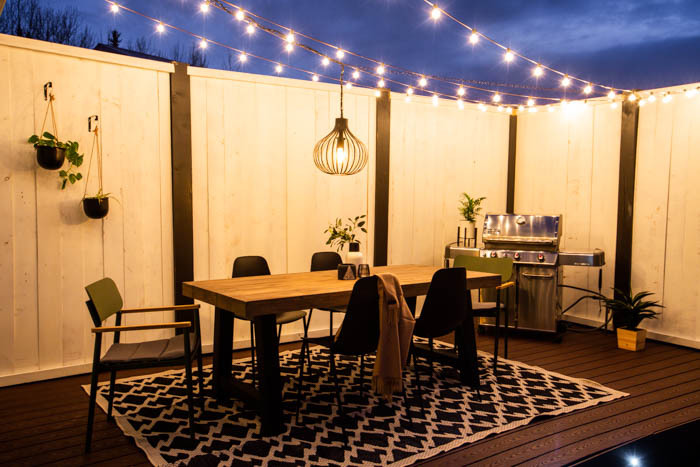 We built the deck base and the privacy walls so that we would finally have a comfortable place to dine outside, but then we didn’t have any outdoor space to fill it, so I started searching and this is the gorgeous space we ended up with this year! Often times we play things safe and we do what’s easiest. We get the side chairs that match the end chairs and they are all the same colour, style and look. But don’t worry if you want to break these rules! 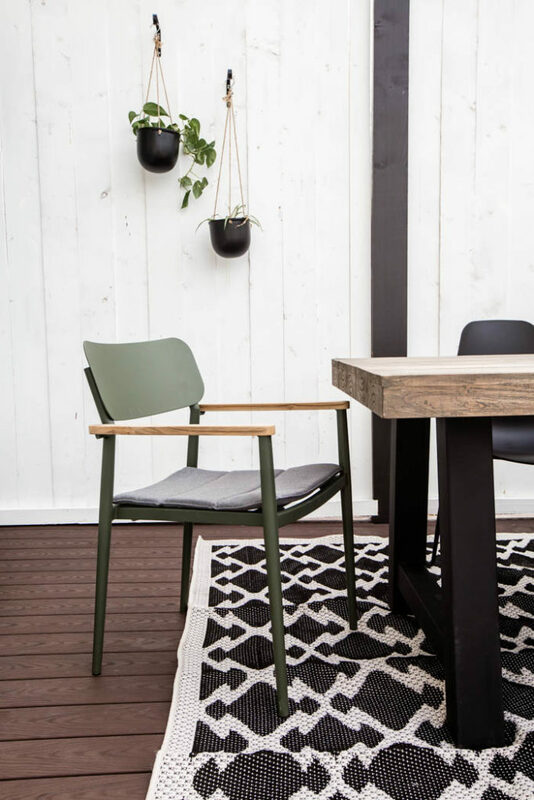 We wanted to add a bit of colour and comfort to our end chairs, so the Green Elan chairs, but you could add a little boho flair to the deck or a bright pop of colour, don’t be afraid to mix things from different lines or styles. This is coming from a true monochrome gal. You know how much I love my black and white! But summers are bright, and cheery, and there are ton of beautiful bright pieces that are also sleek and modern, like this new Industrial Pop line from Article. We opted to get the Green Elan Chairs because green is a colour I love, but last year we were planning to go with bright blue. Don’t be afraid of warm, summery colours. Is your weather hot or cool? Is it humid or dry? Does it rain or snow often? 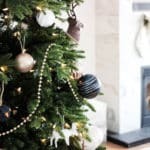 These are all things to consider when choosing furniture. 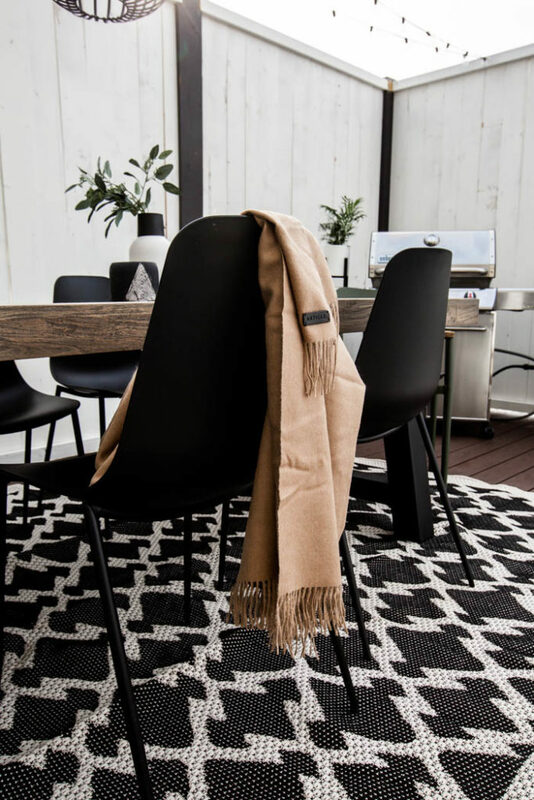 For example, there are a ton of beautiful indoor/outdoor rugs available, but if you get a lot of rain, some of those rugs really hold their moisture, and you would have a soaking wet deck all summer. As far as furniture goes, some materials hold up to certain conditions better than others. hot, dry conditions can make some woods splinter and crack. Wicker doesn’t withstand constant exposure to moisture. High winds will blow around wicker and aluminum chairs. Alternatively, some woods, such as teak and cedar stand up very well to harsh outdoor conditions. Our Teak outdoor tabletop is the perfect example of this. We picked it because it’s gorgeous, but also because we knew it would brave the weather well! You would never by a carpet for the living room without measuring the room to see what fits, would you? 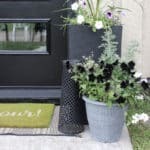 Same principles apply to your outdoor spaces! 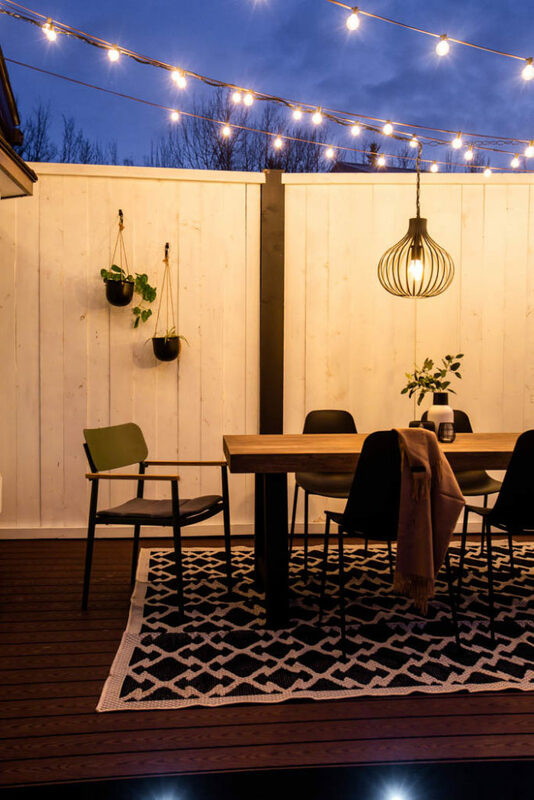 Is your deck closed off with privacy walls like ours, or balcony walls? Or is it an open patio? If it’s more closed off, you want to steer more towards furniture that keeps the space open. 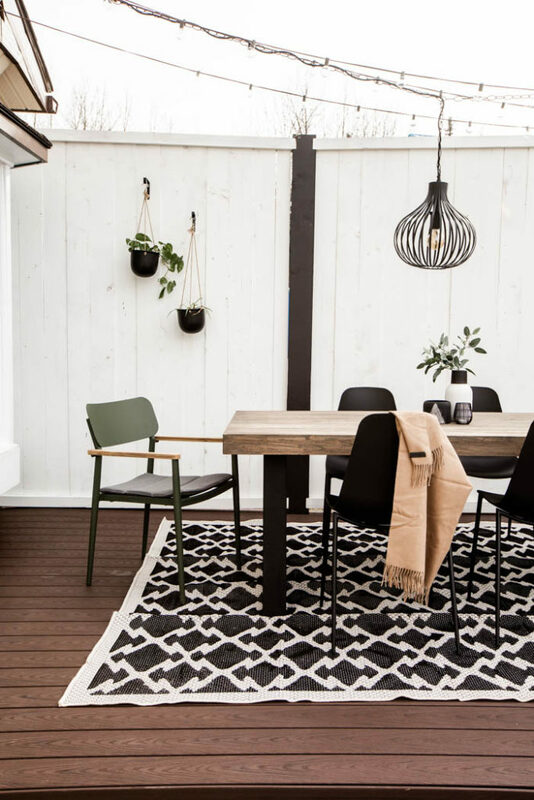 If you’re adding a patio table and chairs, make sure there will be enough room for people to get comfortably in and out of chairs. 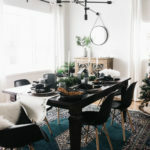 If your space is smaller, consider adding a bar table set with stools that is narrower, or a bench seat to a table that doesn’t inhibit the view or the flow of the space. At the end of the day, this is the most important thing, isn’t it? You want your outdoor space to be an oasis. If you are buying furniture online, make sure to find some honest reviews on the comfort of the pieces and when you can, go sit on them! 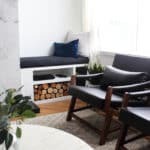 You can also add comfort just for the sake of adding comfort, by throwing on some comfy cushions on the couch or a throw blanket on the back of a chair. We’re so happy with our Article pieces. I’m itching for our bright sun to come out so that we can start enjoying the warm weather again! Just so that you can understand how excited I am for the warm, summer weather, here are a couple of photos of our deck at night. 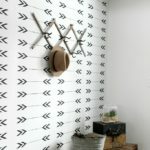 Each month, my friends and I host a Modern Handmade home series and share some amazing home updates, tips, and tricks with everyone. 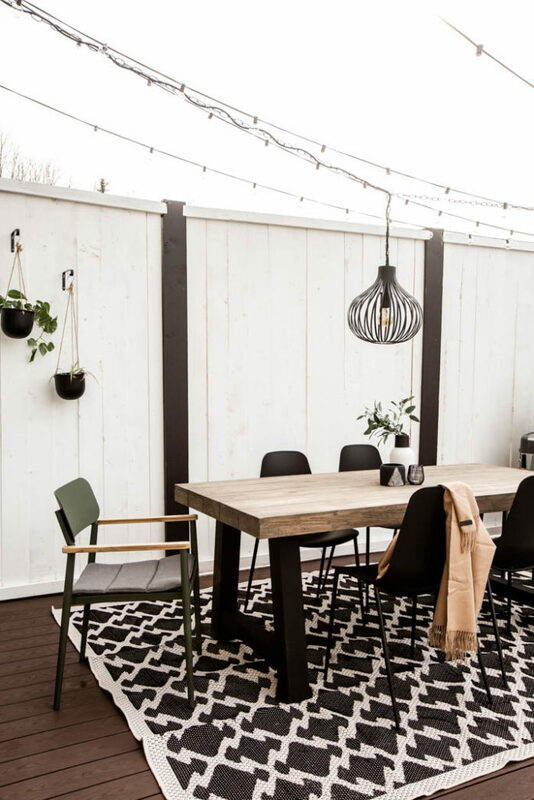 This month, we’re sharing some beautiful deck updates we did with some gorgeous furniture. 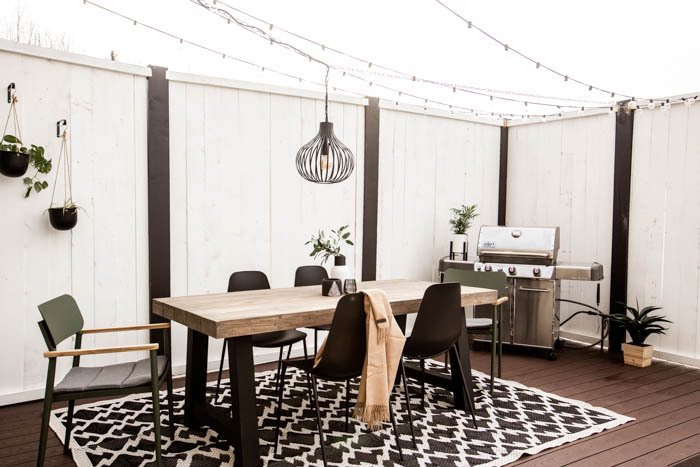 And if you want more stylish patio furniture tips, then trust me, you are really going to want to check out all of these homes!